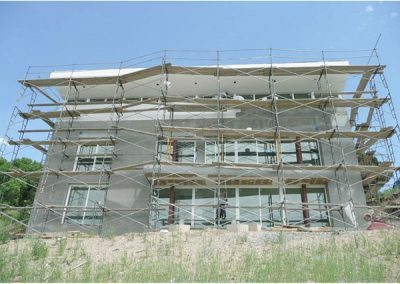 The construction difficulties faced by Joseph Voitehovich in building his dream home would have discouraged a lesser man. 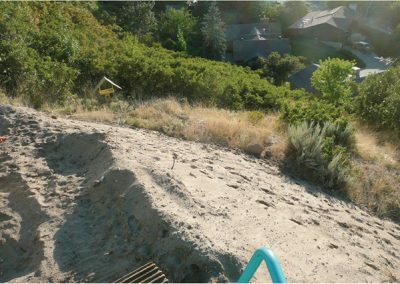 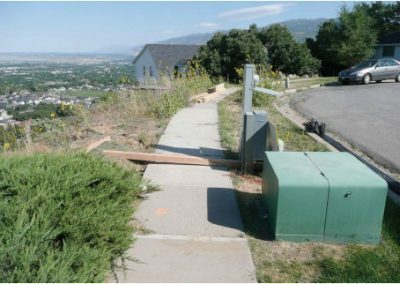 The lot, located at the end of a cul-de-sac, dropped away so steeply that was considered unbuildable for more than 40 years. 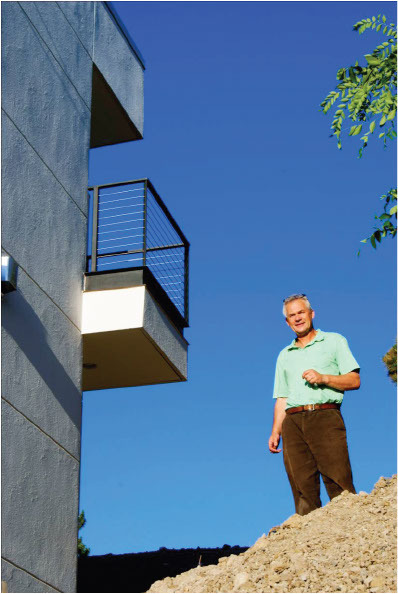 Voitehovich, who immigrated from Russia 20 years ago, is an internationally recognized architect, perhaps best known for designing the Salt Lake City (Utah) Library. 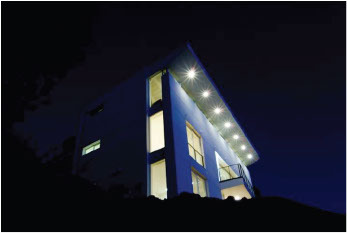 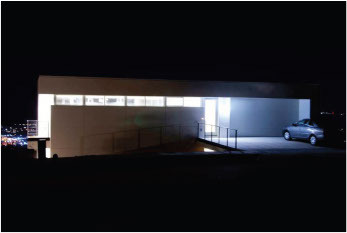 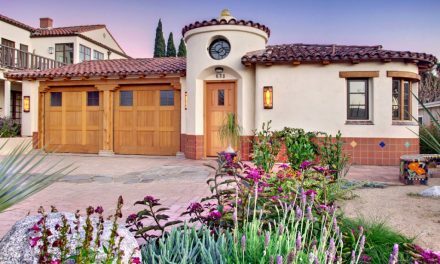 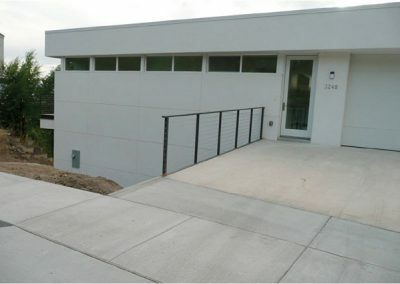 And this home, designed as a work of art, is the culmination of ten years of work. 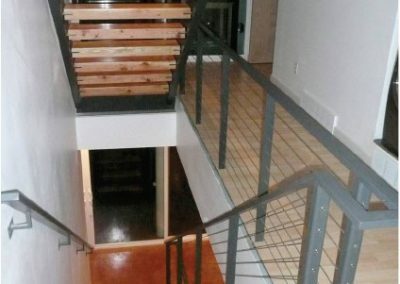 It would all but eliminate right angles. 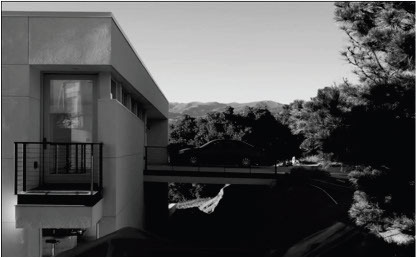 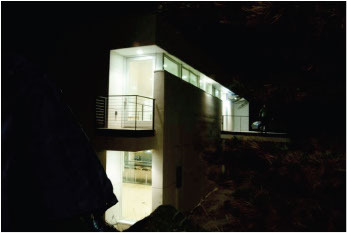 The back of the house, which doubles a retaining wall, is bent precisely five degrees at its midpoint. 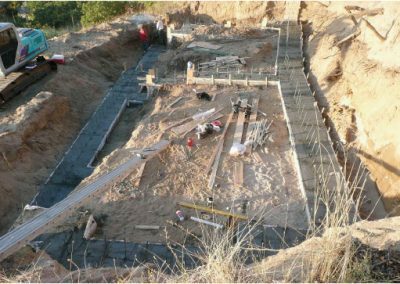 No two walls lie in a parallel plane, so many corners were either 84 or 96 degrees. 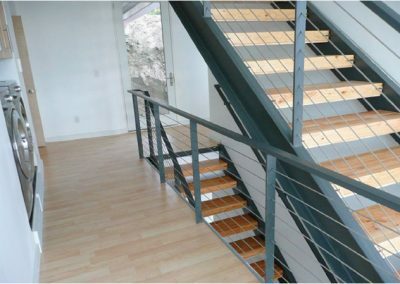 Nine corners had to be custom cut. One 84 degree corner went up 31 courses to a final height of 41 feet. 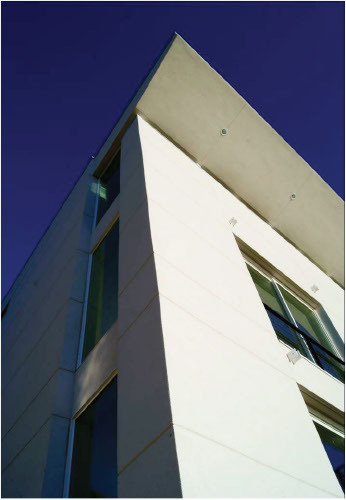 the sides and top, creating extreme engineering challenges. 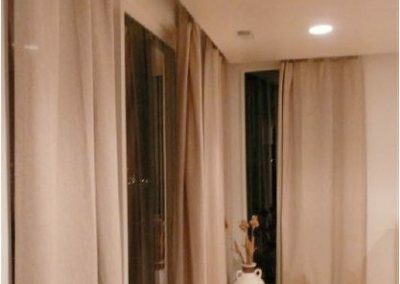 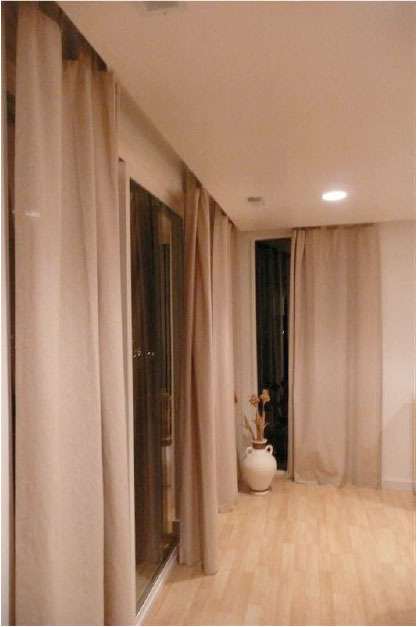 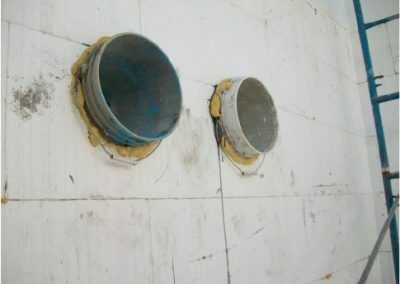 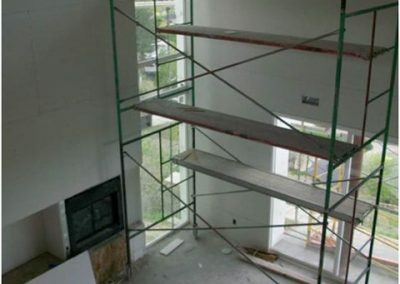 Additionally, the owner insisted that the walls be within 1/8” of plumb at all points. 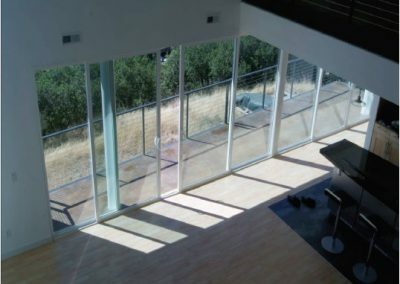 to take maximum advantage of winter solar gain and summer shading. 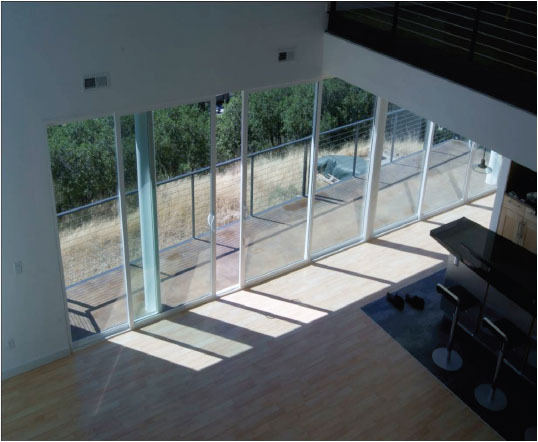 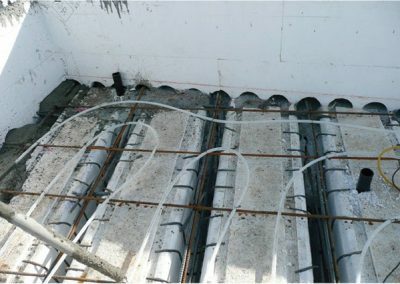 Radiant heat in the concrete floor is combined with a concrete/EPS decking system to maximize efficiency and reinforce the unusual design. 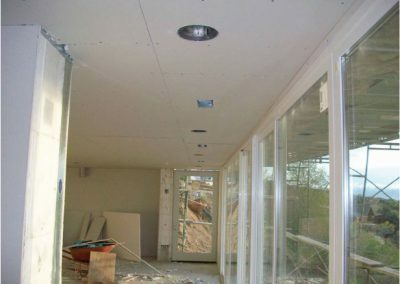 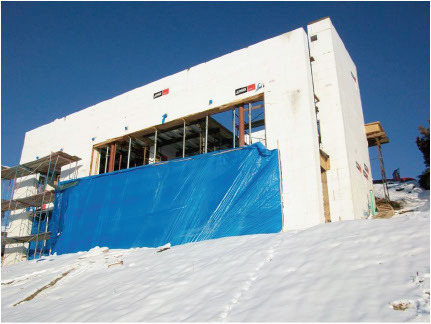 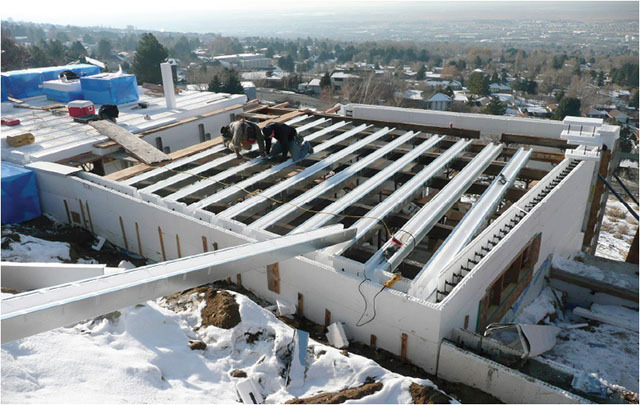 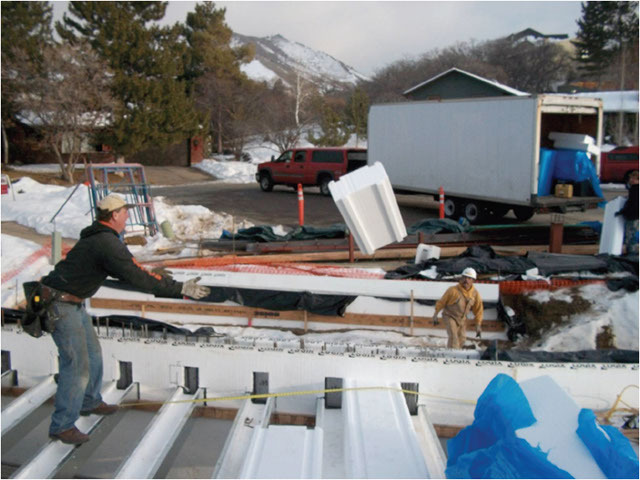 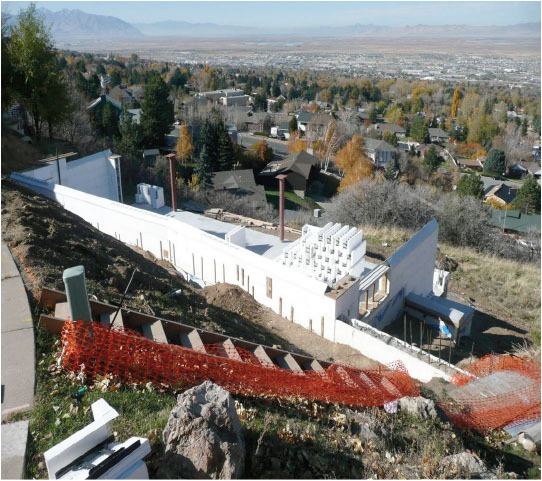 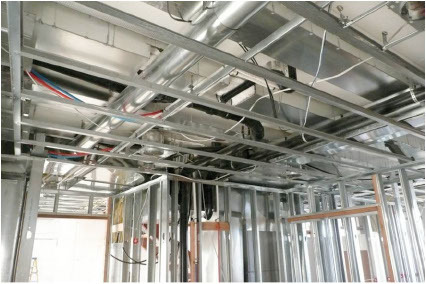 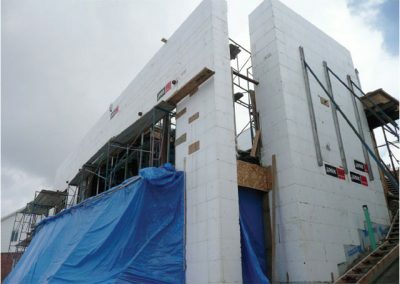 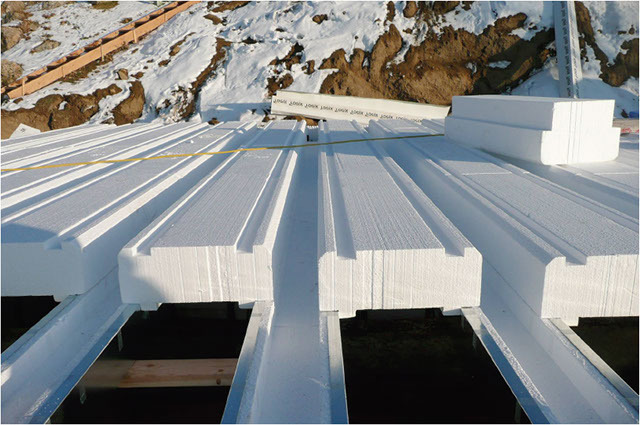 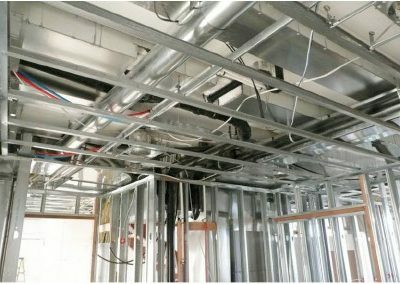 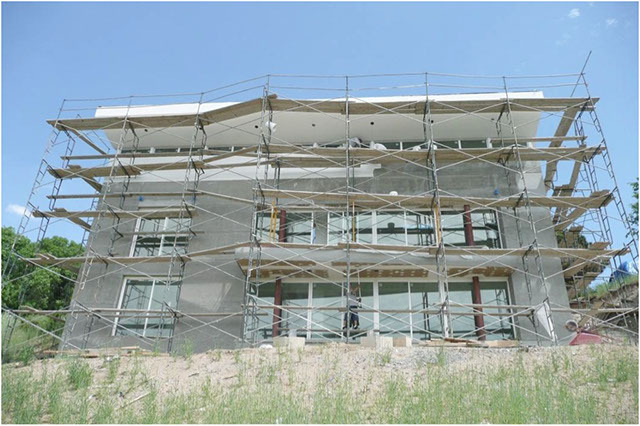 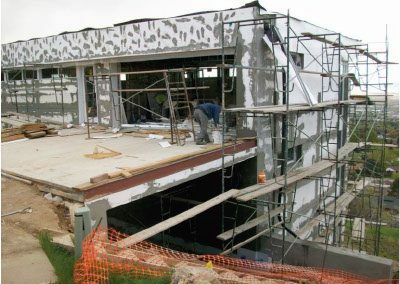 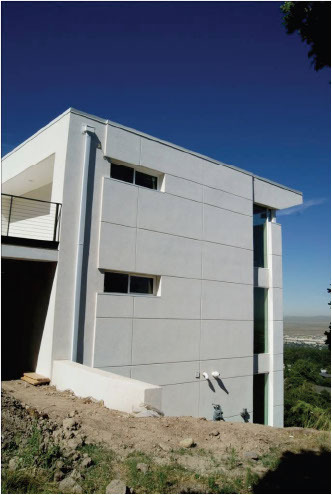 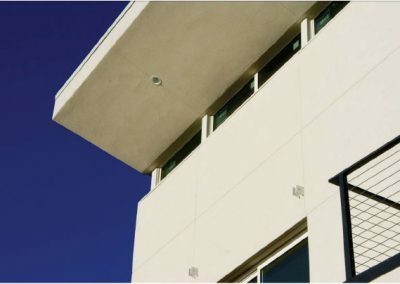 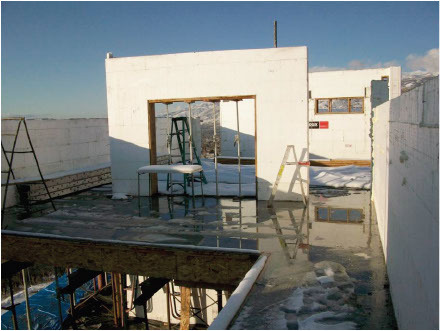 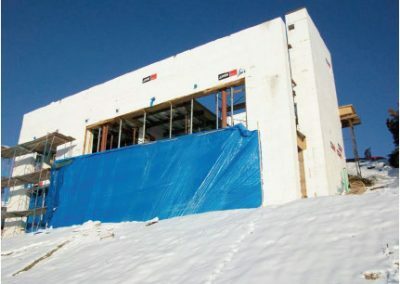 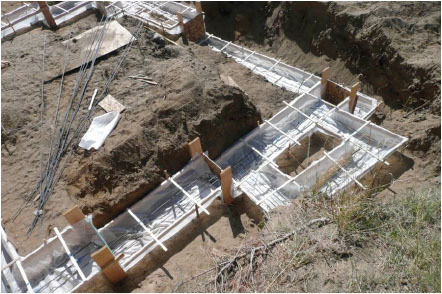 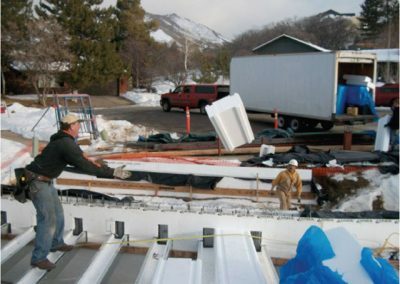 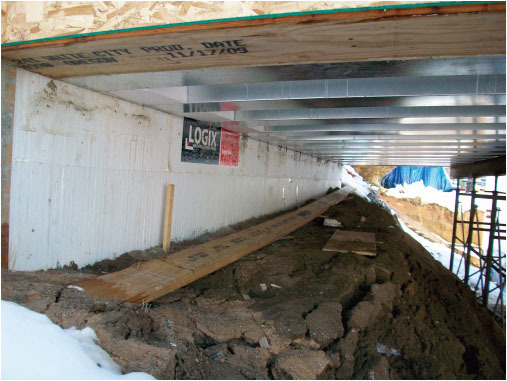 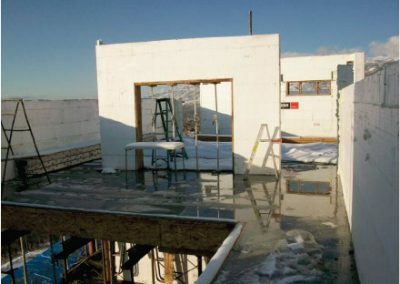 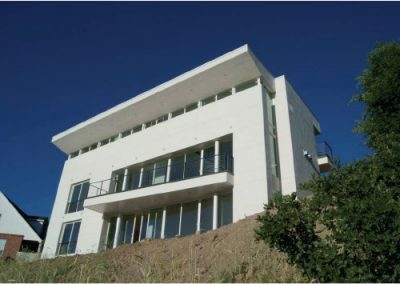 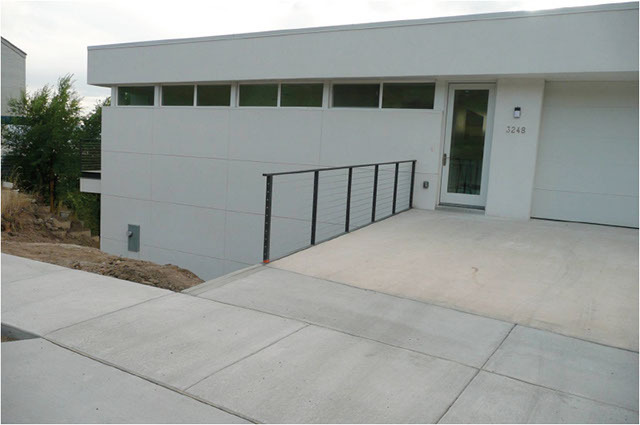 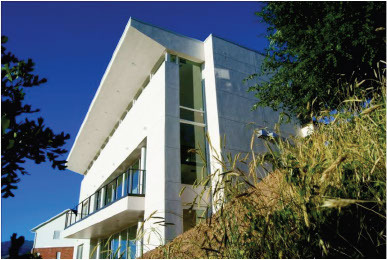 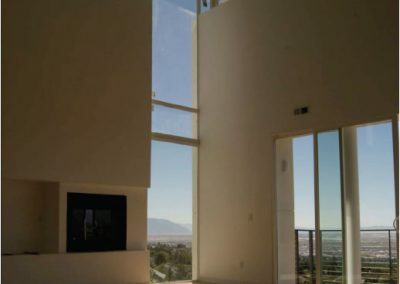 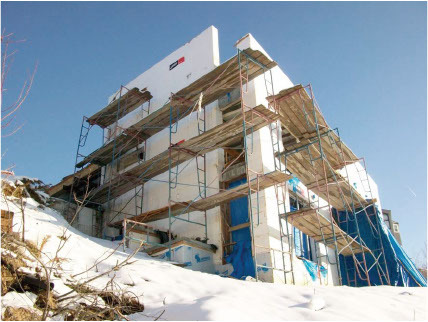 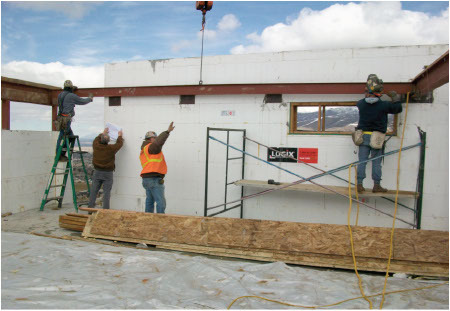 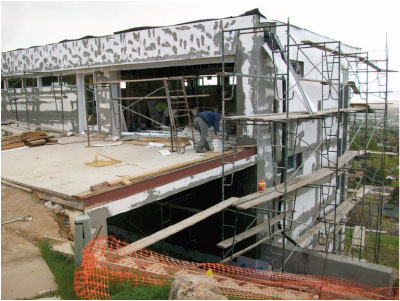 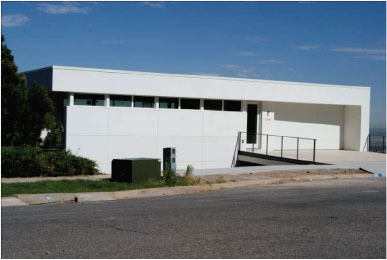 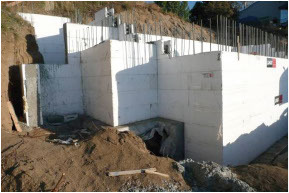 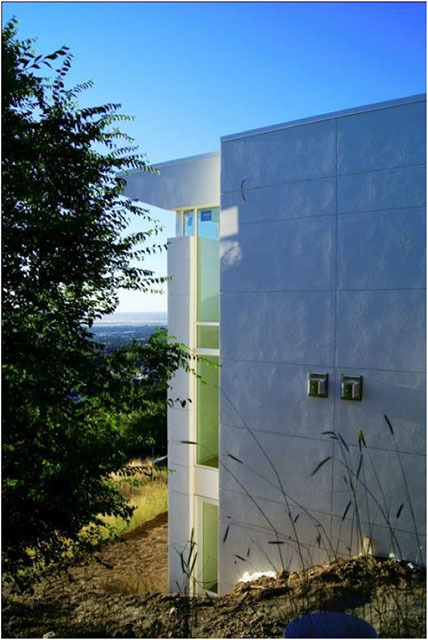 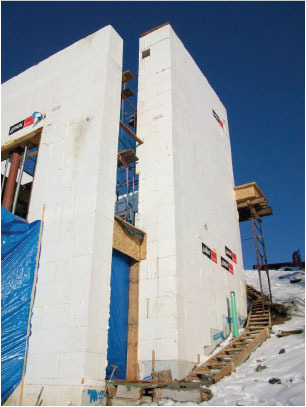 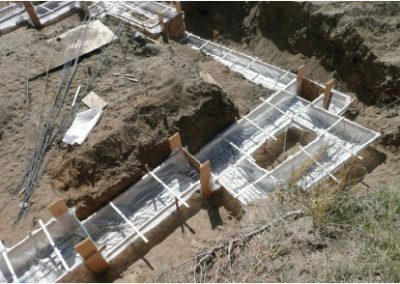 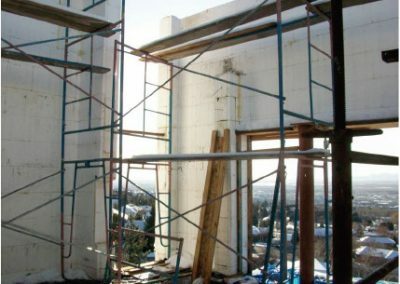 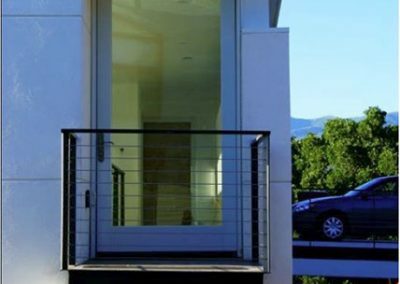 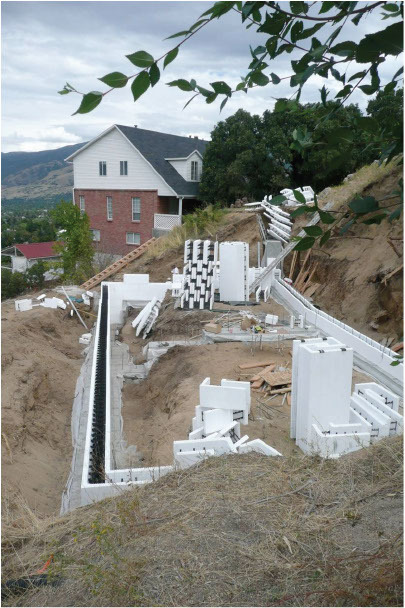 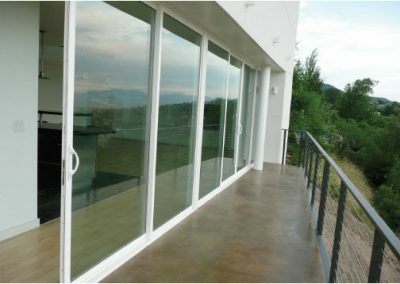 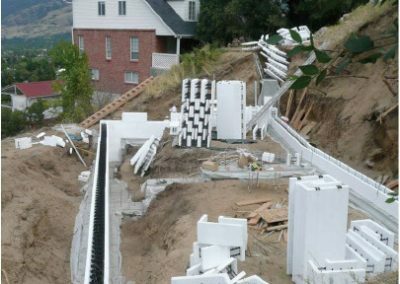 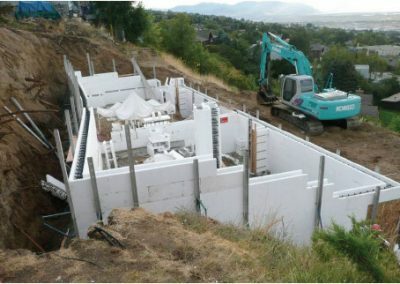 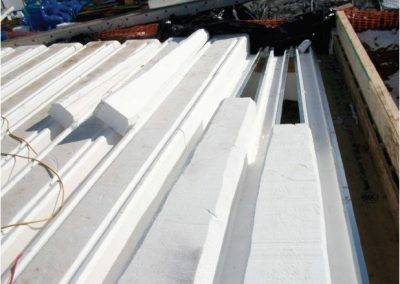 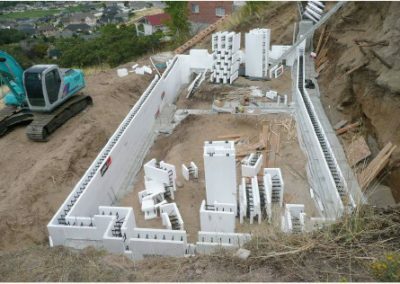 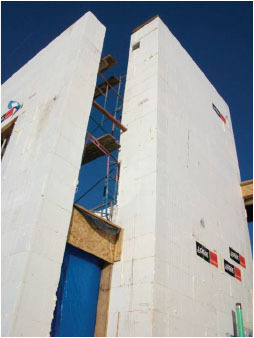 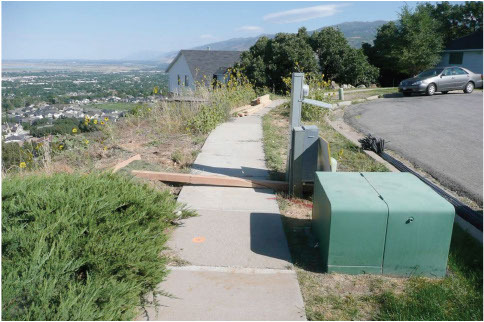 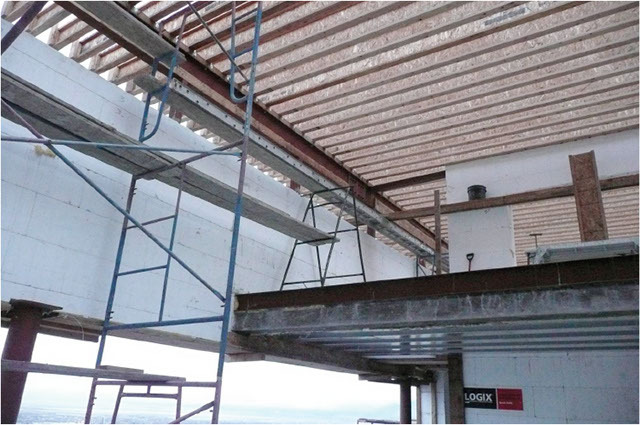 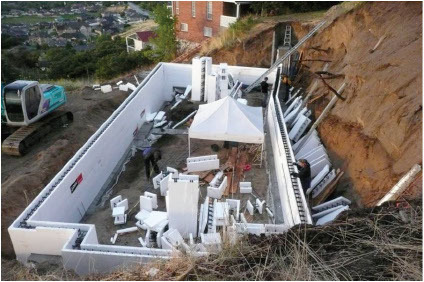 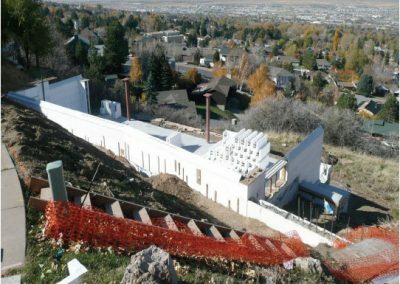 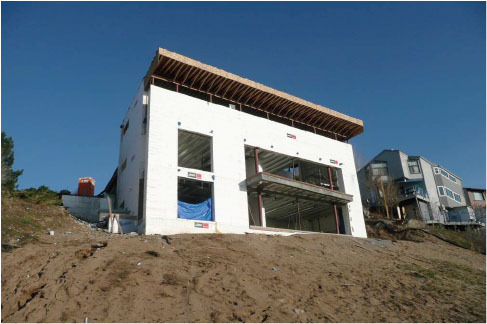 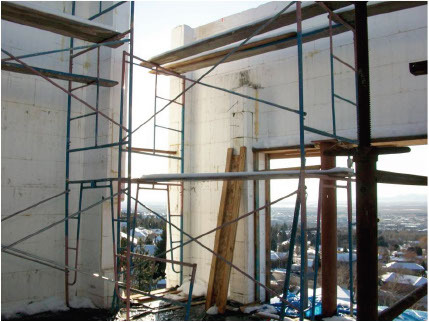 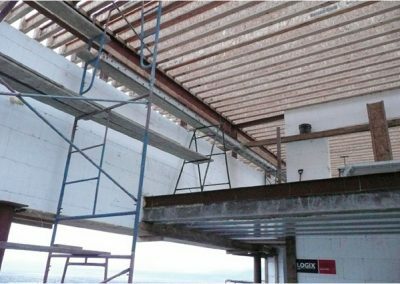 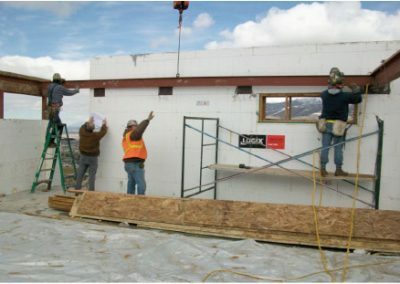 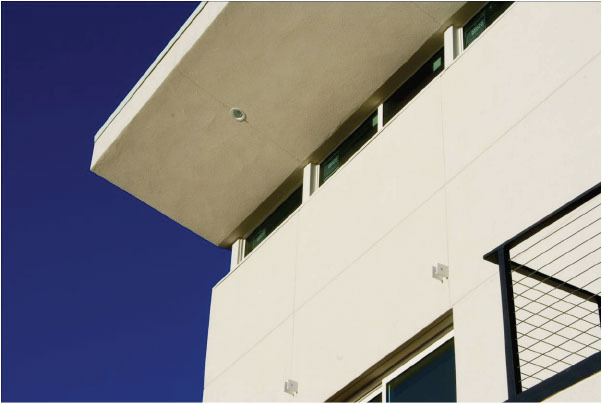 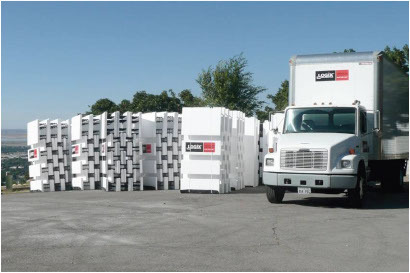 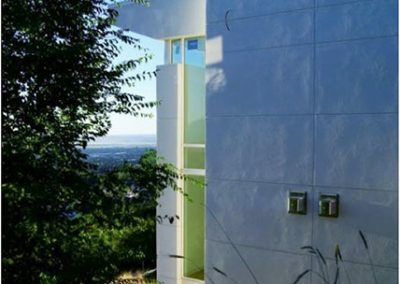 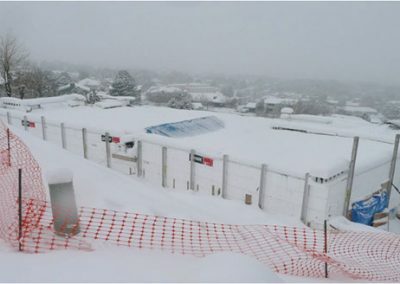 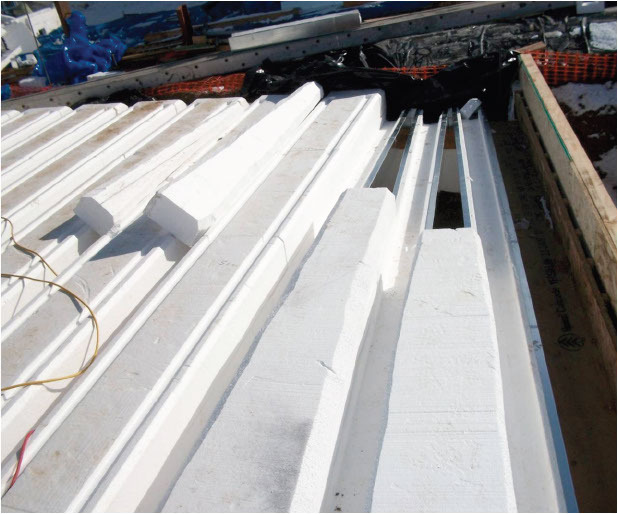 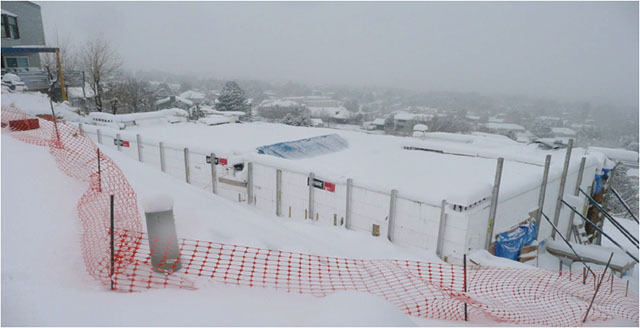 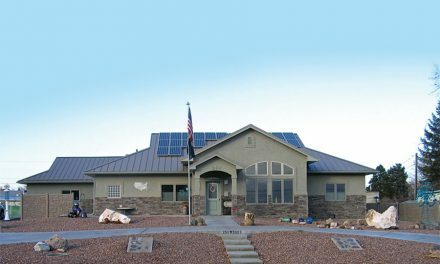 Dan McCullough, a Utah-based Logix distributor who supplied the ICFs, served as general contractor and ICF installer on the job after several others balked at the project’s complexity. 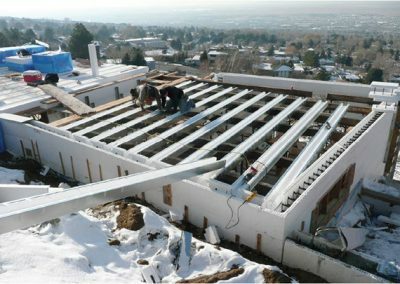 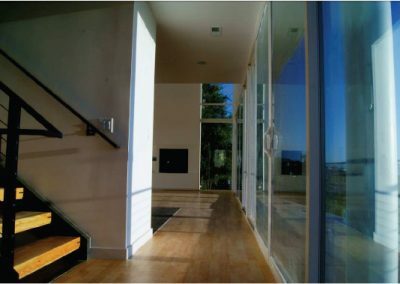 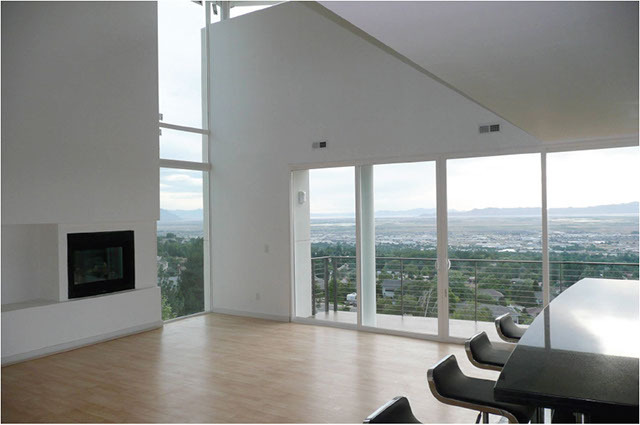 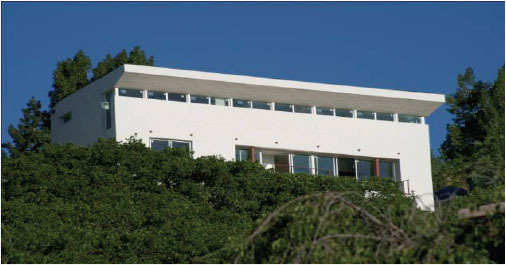 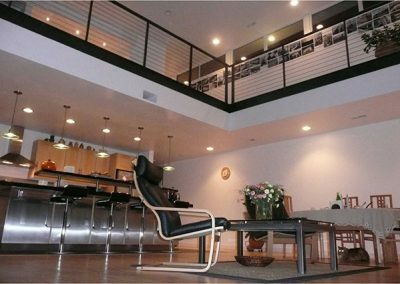 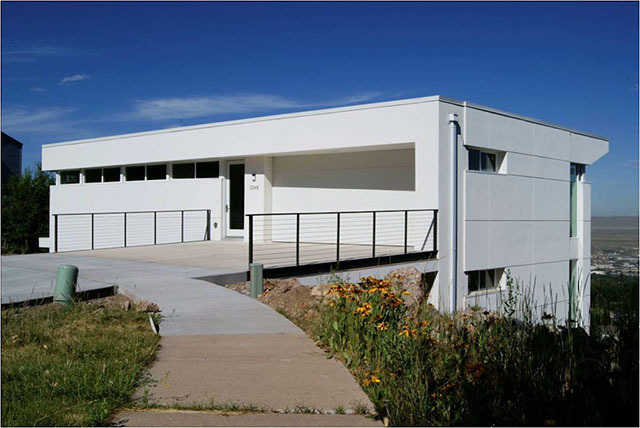 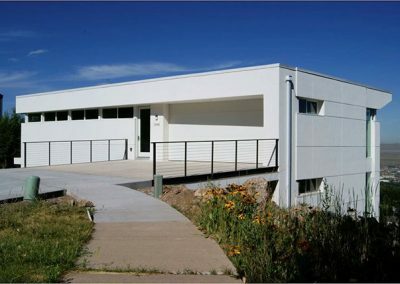 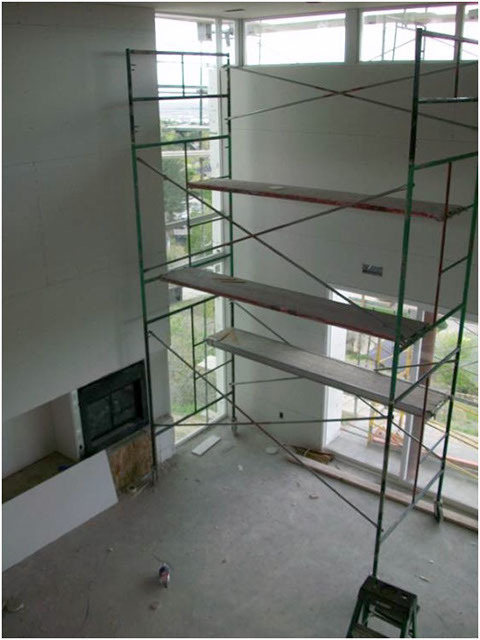 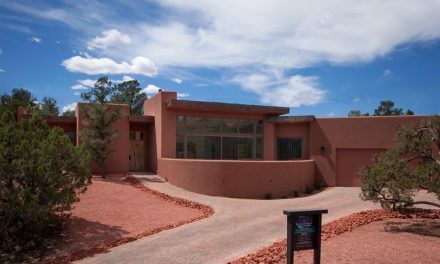 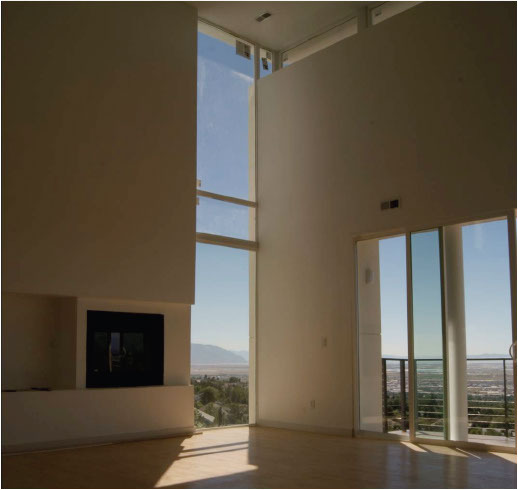 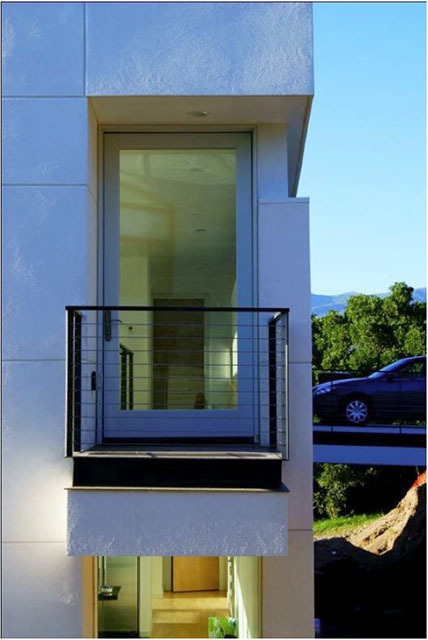 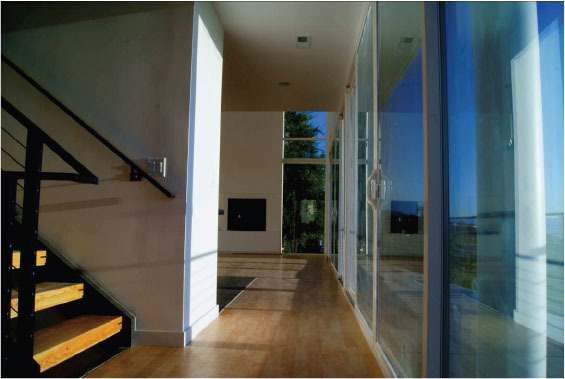 The thermal mass provided by the Fortruss ICF Floor systems coupled with the energy efficiency of radiant heat were made for each other. 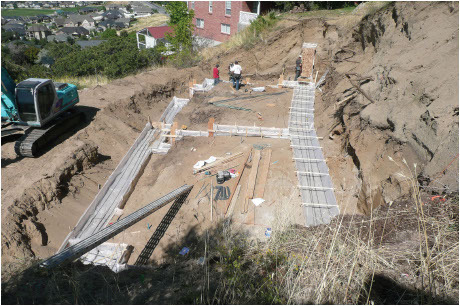 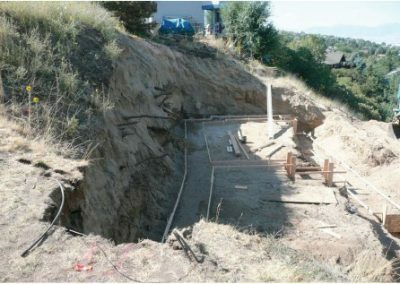 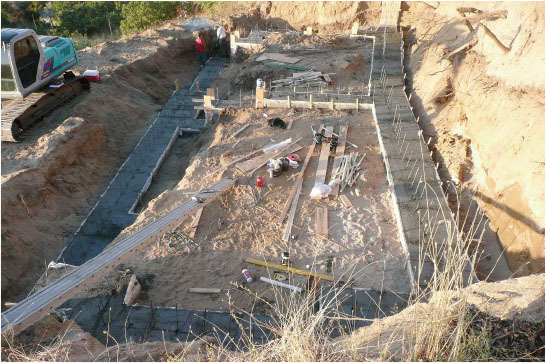 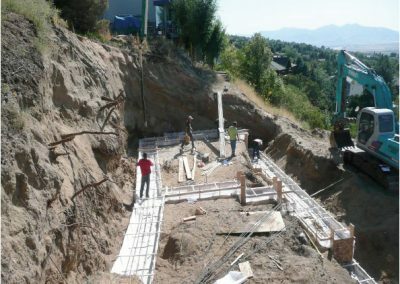 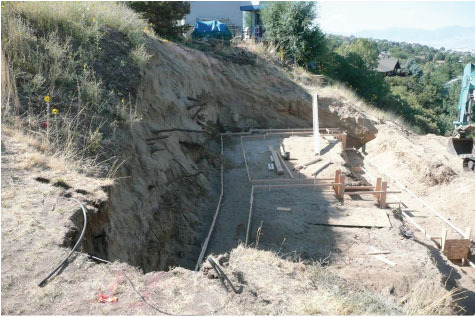 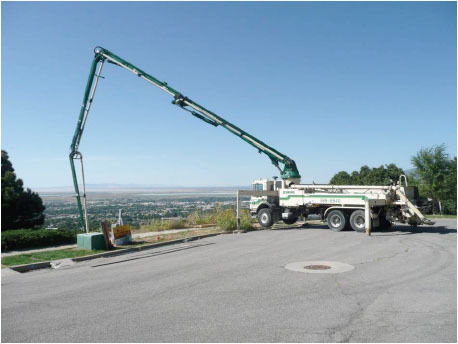 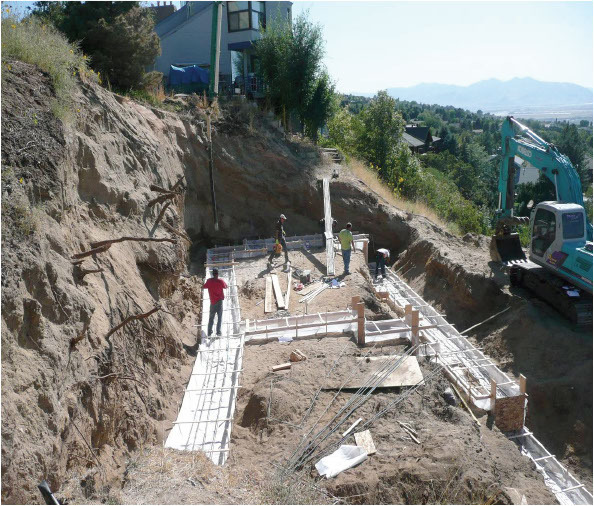 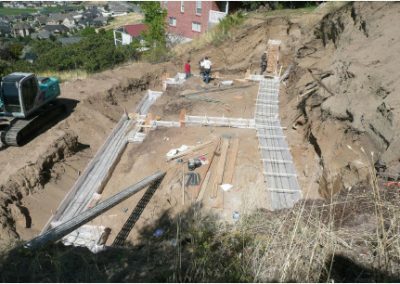 Working under tight deadlines set by the financing agency, McCullough and his crew worked 12-hour days to get the foundation up and backfilled. 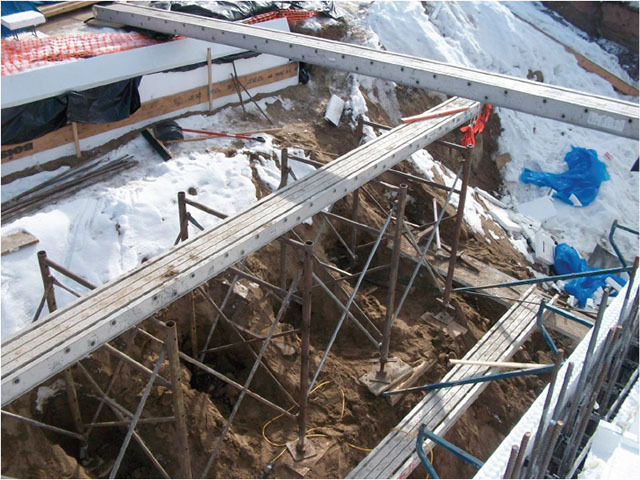 Much of the work was done using headlamps in the short winter days. 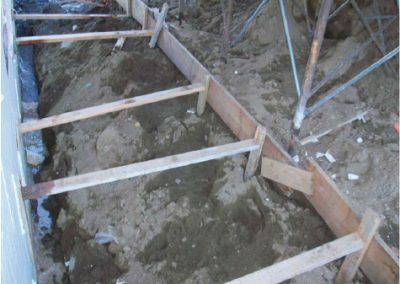 Midway through the excavation, it was determined that the foundation would have to be nine feet deeper than previously thought in order to reach stable soils. 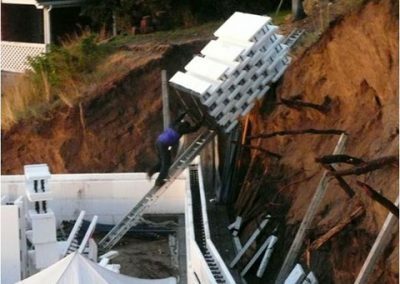 This in turn, made it impossible for the excavator to get off the lower part of the lot. 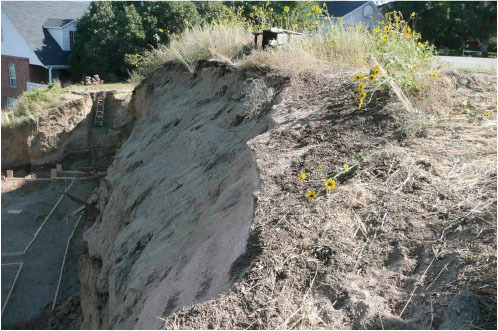 “He had literally dug himself into a hole,” says McCullough. 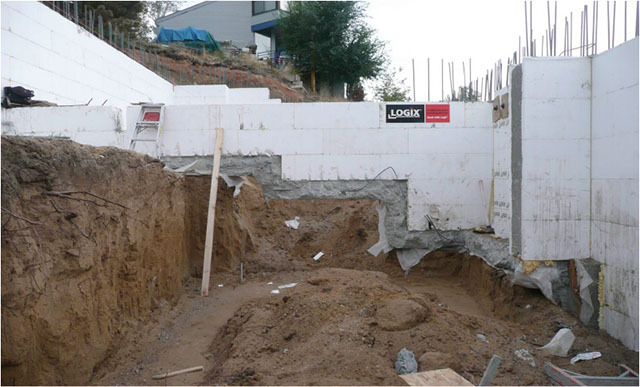 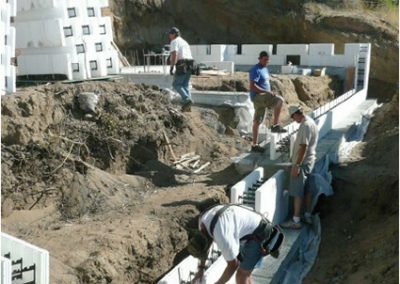 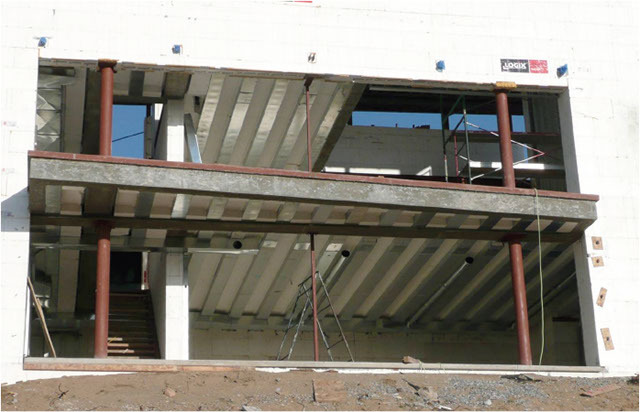 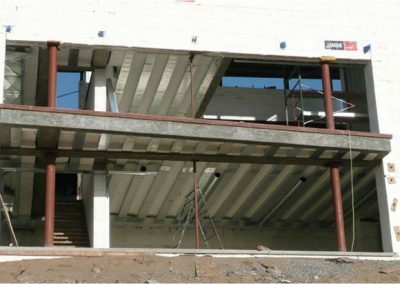 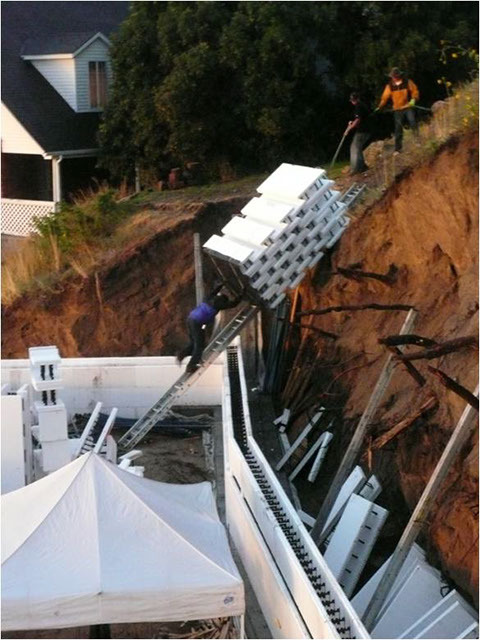 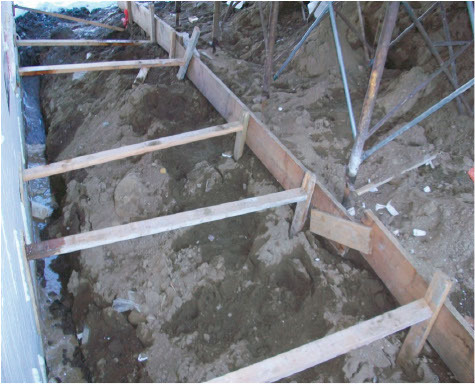 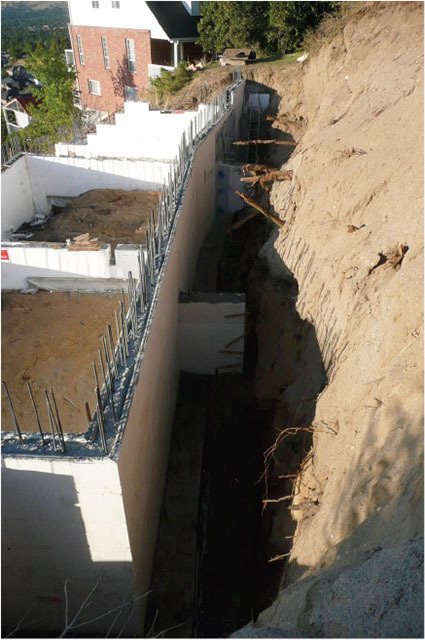 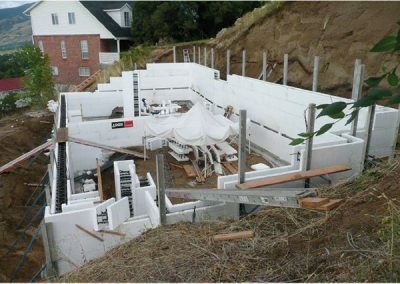 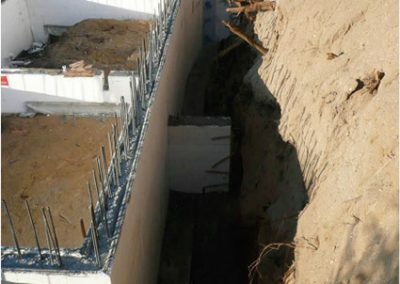 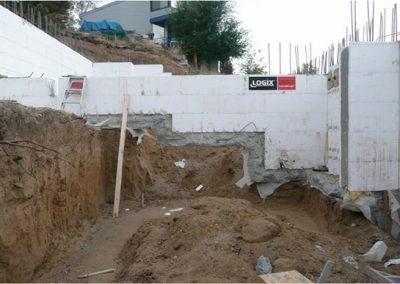 “Our solution was to stack and pour the walls in a stair-step manner so the excavator could backfill against the foundation and create a ramp to get out. 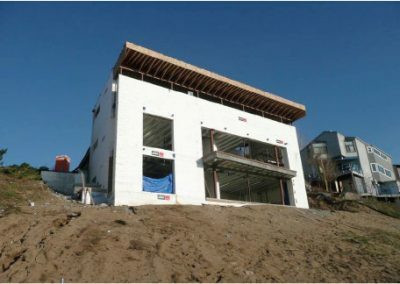 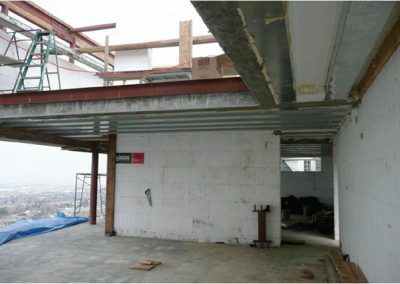 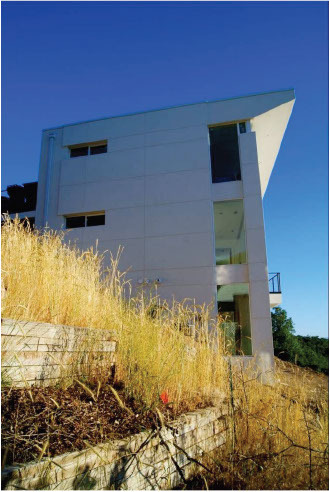 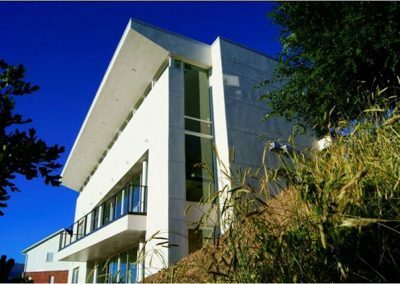 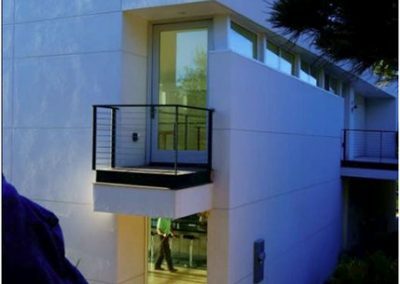 The extreme slope of the lot, unstable soils, and floating walls meant the job would require a lot of steel and a lot of concrete. 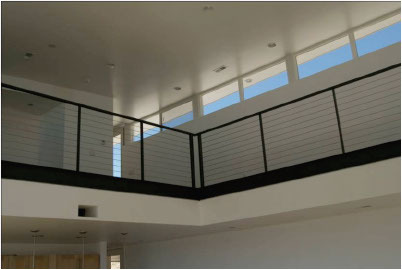 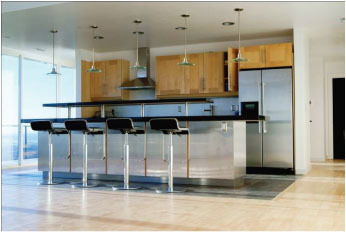 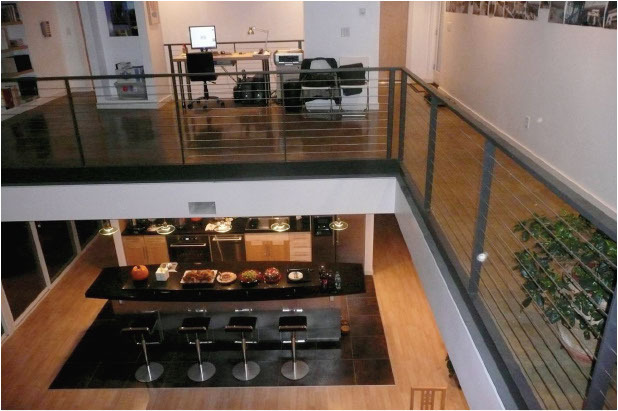 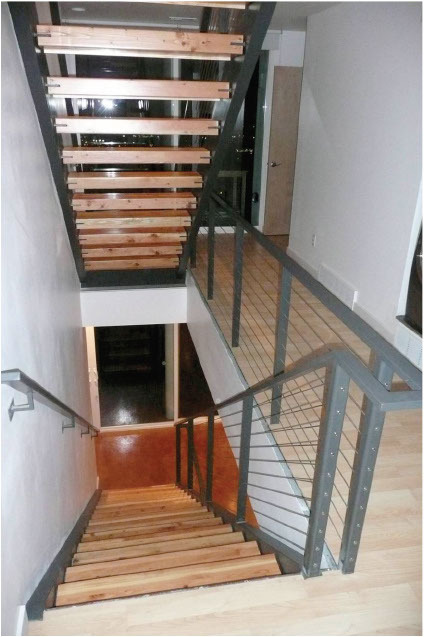 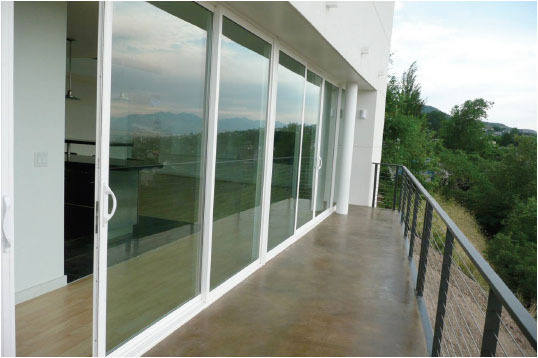 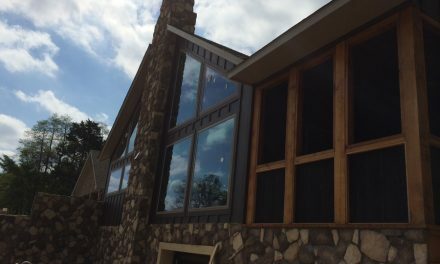 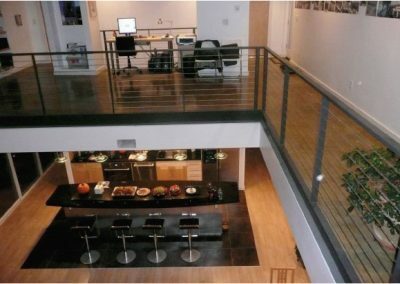 “For the majority of the house we used two #5 bars 8” on center both vertical and horizontal,” McCullough says. 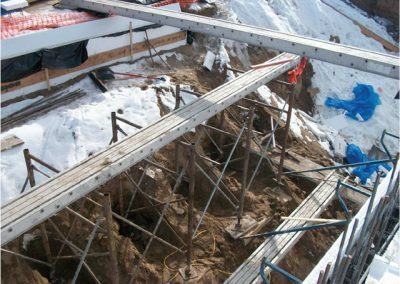 It ended up with about 58,000 linear feet of rebar and 262 yards of concrete placed in 15 different pours. 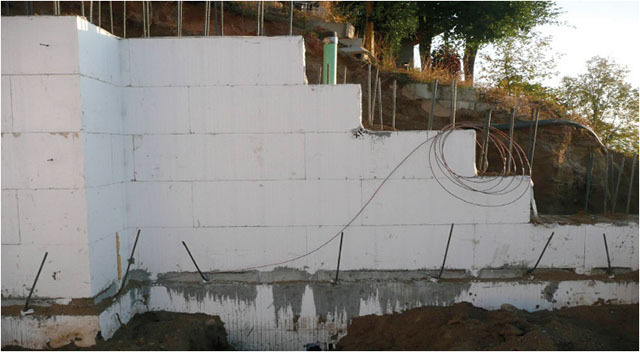 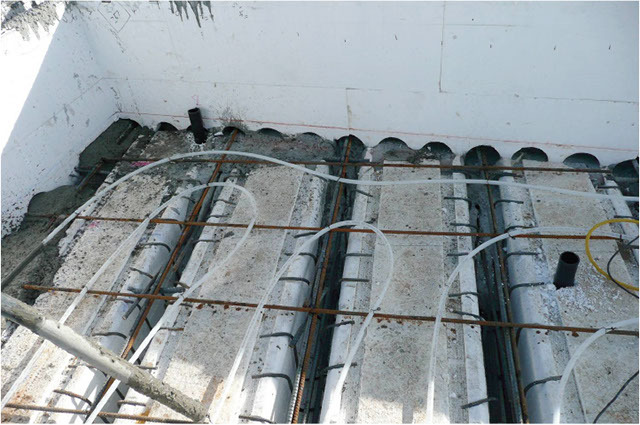 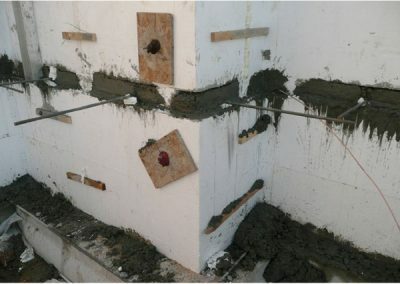 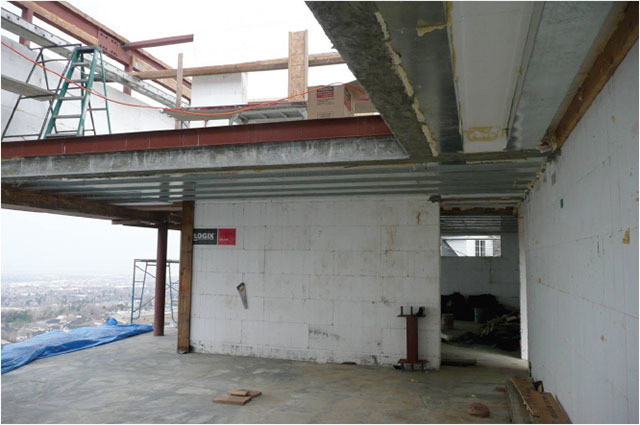 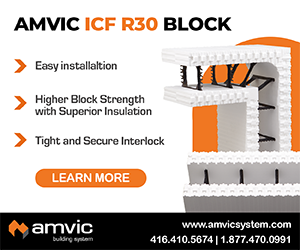 ICFs were used for exterior and interior walls, embankment reinforcement, parapets, foundations for the bridge into the garage, even a lawn bench and pedestal for the air conditioning unit. 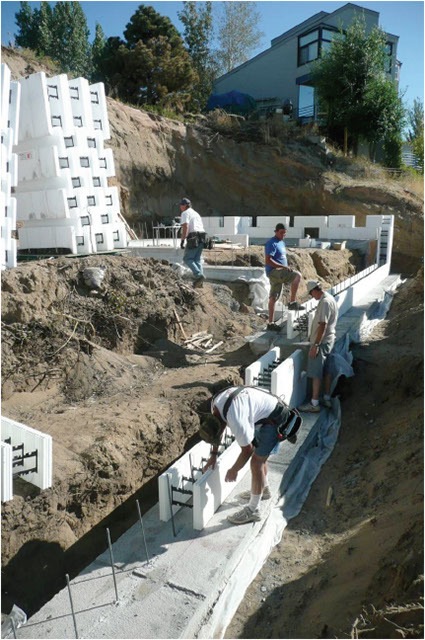 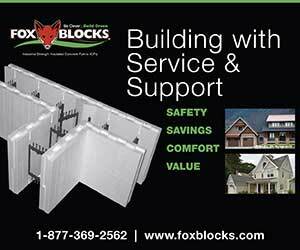 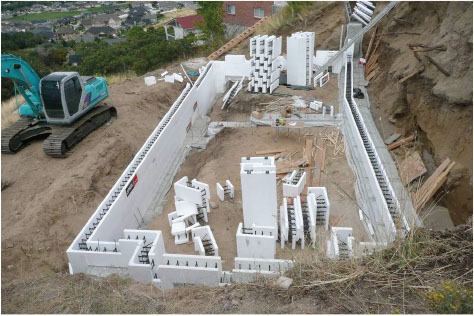 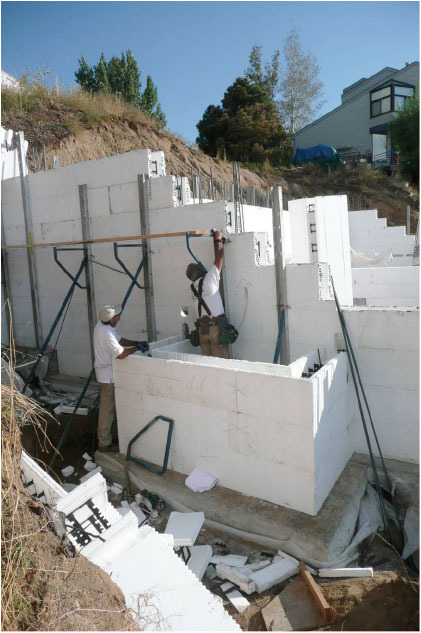 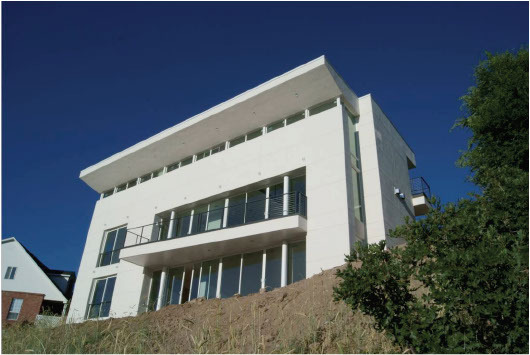 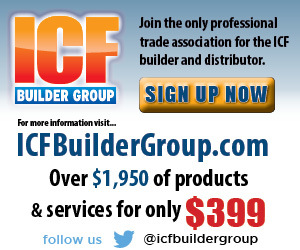 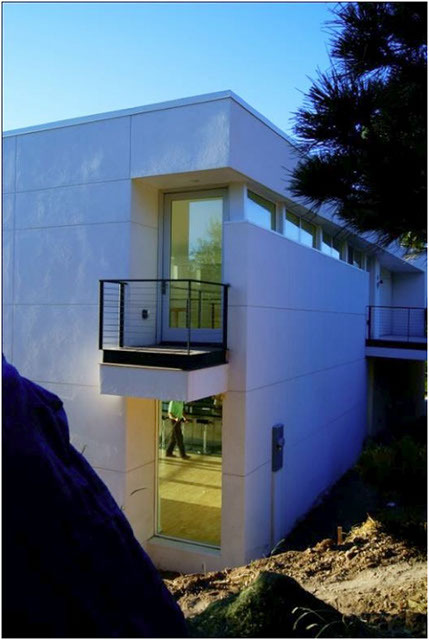 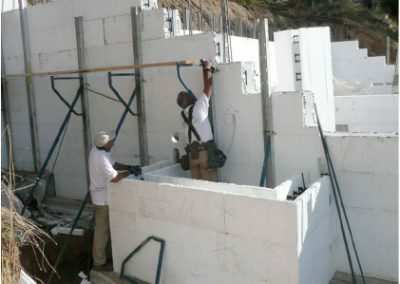 In all, the job used just under 1,500 ICF blocks. 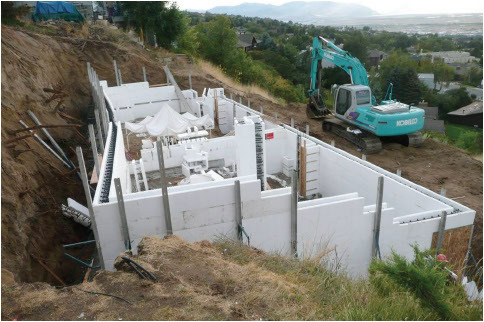 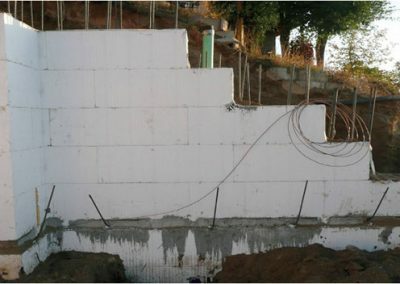 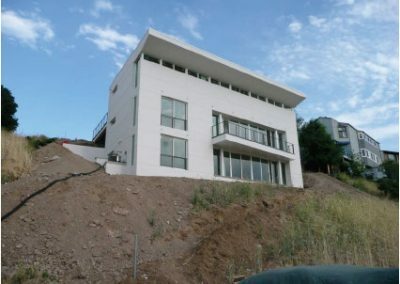 ICF Use: 6,660 sq. 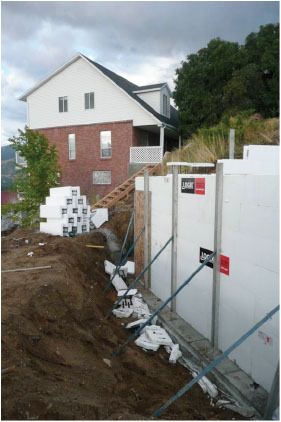 ft. (All exterior walls) plus 1,300 sq. ft. of interior wall and 2,200 retaining walls. 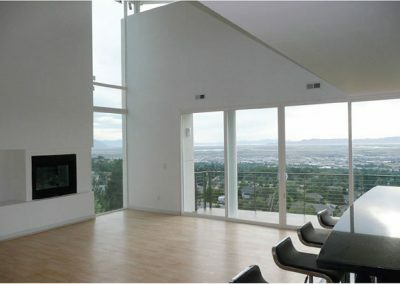 Additional 3,000 sq. 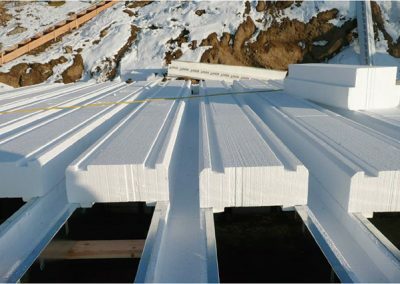 ft. of EPS decking.